Be The First To Know About New Videos And Tutorials! Get an email from Chris once a week with links to the latest free videos and tutorials. Hey, it’s a new website! We can’t convert everything over at once — but I do have two new CCNP ROUTE / TSHOOT practice exams for you! Thanks for coming by and for making me part of your CCNP success story! 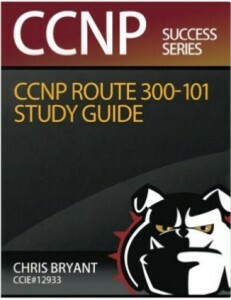 — Chris B.
PS — Check out my CCNP ROUTE Study Guide on Amazon, now available in hard copy and soft!